When I was a little kid, I used to misplace my money all the time and sadly lost a lot of my savings. However, I eventually found out that banks and other financial institutions could actually take care of my money for me! Although kids don’t typically have to use banks at their age, they almost certainly will have to learn how to take advantage of bank services in their later years, whether it be for major transactions such buying a house or for smaller purchases such as buying groceries at the local supermarket. Banks can help keep money safe from thieves and robbers, ensure that money is not accidentally misplaced or lost, and offer convenience (most institutions and banks are near your home and also offer ATM services nationwide). Banks offer a wide variety of services to their clients, including offering loans and storing money for withdrawal at any time. While there are multiple ways of storing money in banks, the two main services offered by the majority of banks are saving accounts and checking accounts. While the two vary considerably in their purpose and restrictions, they are both excellent ways to make sure that your money stays safe! Banks offer checking accounts mainly for people seeking to pay for regular transactions and everyday responsibilities, such as rent, electricity bills, groceries, and other bills. Using a checking account also allows you to access money from ATMs at any location. However, instead of paying with cash, people with checking accounts pay using either checks or debit cards. Checks are slips of paper that are practically the same thing as cash money, but they are safer to use and a lot easier than carrying around lots of money. Checking accounts also come with debit cards. Debit cards allow you to access and take out money from a checking account with simply the swipe of a card! You might have even noticed your parents use their debit cards when paying for groceries and gas! Above is an example of a check. This check lists the person taking out money, the person or organization that the money is going to, and the amount of money transferred. 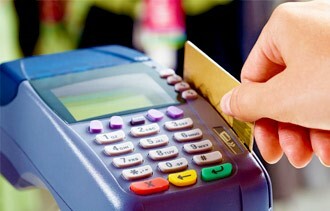 Above is an example of a debit card making a payment by swiping the card on the machine. While saving accounts are quite different from checking accounts, they are also very effective at saving money. Saving accounts are designed for people who want to save large amounts of money for a large transaction, such as buying a house or a new car. In order to create a savings account, you would need to deposit a certain amount of money into your account. Some banks may require you to deposit a certain minimum amount of money in order to open your account. After depositing your money, you can let your account gather interest. Interest is a certain percentage amount of money that a bank will give to you for the privilege of keeping your money. For example, if you have a savings account with $100 in it and a 10% monthly interest rate, then the bank will give you an additional $10 (10% of 100 is 10) for every month that you keep your savings account! Yes, you can actually make money off of saving money! Banks can help you keep your hard-earned money safe from potential threats and allow you to save money for things you want to buy in the future. Through opening checking accounts and savings accounts, every amazing kid has the potential to get involved in the banking world at nearly any age!